I don’t want to crowd this blog with bean posts, but a friend did make a special request for this recipe. And no one should be denied this gem of a dish, it has become one of my favorites. It was a hit at a recent dinner party, and thus the recipe request. More of a fall or winter meal, truth be told, I still enjoy it year round, usually just changing the protein according to the season. The first time I made these Cannellini beans was for my birthday a few years ago and I’ve been making them and tweaking the dish ever since. The recipe is adapted from Danny Meyer and Michael Romano’s 1994 Union Square Cafe Cookbook, a book I stole from my sister, or she was getting rid of it, I can’t remember. Thanks Hope! It’s my go-to book for simple, inspired Italian cooking (along with the Silver Spoon). Drain the beans and place in a large saucepan on the stove, covered by the stock or water or a combination of both, to cover by about 3 inches. Add the salt, celery, carrot, onion, and juniper berries and bring to a boil. Turn down to a simmer, cover, and continue to simmer for about one hour, or until the beans are thoroughly cooked and tender. Discard the vegetables, but be sure to reserve 1 1/2 c of the cooking liquid. 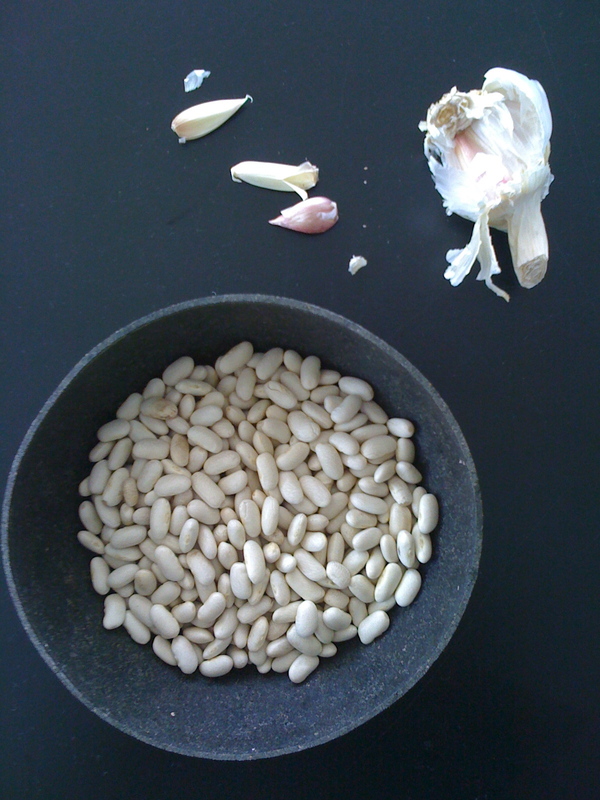 In a large skillet, heat the olive and garlic over medium heat, being careful not to burn the garlic. Add the beans to the skillet with 1 1/2 c of the cooking liquid, bring to a boil, then add the herbs and three quarters of the cheese. Continue to boil until the liquid reduces to the consistency of a sauce, about 10 minutes. Don’t worry if some of the beans begin to disintegrate into the sauce. Add additional salt and pepper to taste. Transfer the beans to a serving dish, adding the remaining cheese and some additional olive oil if you’d like. I like to serve these with sauteed broccoli rabe, and either a white meaty fish (cod, hake, arctic char), or a braised meat, pork tenderloin, or sausages. If there are leftovers (I recommend doubling the recipe) they make for a great lunch on their own the next day.